Kashmir is or rather we need to say was considered as the heaven on the earth. The fantastic ice-clad mountains, the green fields, the flowing rivers, the lakes in the middle of the valley, the respected shrines, non-polluted air, the chirping birds and many other factors bring a soothing experience for anyone who visit the place. But, it is also true that being situated at the bank of Himalaya, Kashmir is one of the border states which was invaded many times. The brutal mass-massacre by Aurangzeb and other rulers is not the single case. The pandits of Kashmir are forced to flea from the place in order to save themselves and their honor. The atrocities by the invaders is inhumane and haunting. Recently, we came to read some of the books where the story unfolds on the canvas of Kashmir. In some books, it is referred directly and in the others. indirectly. Here is a quick link to one such book. 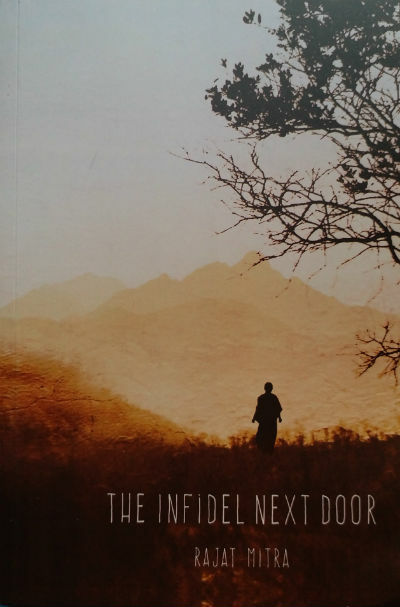 So, when we came to know about The Infidel Next Door by debutante author Rajat Mitra we were curious to explore it. Fortunately, I got the chance to read this book from our team and here are my unbiased views and review for the same. Please note that the book is provided to us by the author, but it has no influence on the review by any means. Let us take a look at the cover page of the book. The cover page doesn’t reveal much about the book, at least on the first glance. Actually, the people have a specific image of Kashmir in their mind. That is of a heaven. The blue background, snow-clad mountains and greenery is expected. The book cover gives an impression of rather a dull picture. It actually reflects that burning situation there in the valley considered nothing less than a heaven. An alone person standing there reflects an important aspect of the book. Overall, the cover page is meaningful but not very impressive. Krishna Naryan, a priest in a temple of Lord Shiva in Kashi (Banaras) is feeling really happy because due to his Guru’s influence a family got ready to let their girl Gayatri marry him! No, it is not like a normal arranged marriage kind of a thing. As we progress reading the book, we come to know that the roots of Krisha is in Kashmir, the heavenly valley (or what it used to be) of India. There is a legend according to which the ancestors of Krishna made a grave mistake or rather we call it a sinful act, due to which no one was interested in keeping a good rapot with him by any means. Then why Gayatri’s family is ready for the same? Well, there is a reason. But, we cannot talk much about it. The maried life of Krishna went on normally, and in the due course Gayatri became pregnant. After some complications in social life they both are blessed with a baby boy. Their Guru professed that the boy will do something remarkable. The boy was named as Aditya Narayan. Looking forward to the bright future of the boy, Krishna tried hard to make him live the life of celebacy and made “a quest to learn the scriptures” the sole purpose of his son’s life. He was not allowed to play with the other kids, or touch the untouchables. So a scholar was growing in him, but, a boy was dying with the same speed. He got to learn a lot of lessons in his life where he was at the loggerheads of the beliefs, taught to him and experienced by him. Almost, around the same time, Imam Siddique, an educated muslim scholar was appointed as the Imam of a mosque in Kashmir. He considered Islam as the religion of peace. He was open minded and was quite against the hatred some hardliners tried planting into the minds of youth and making them stone pelters (and terrorists gradually). Imam’s son Anwar was following his father’s guidelines. Some experiences in his life and his growing aquitance with Haji Sahab make him think differently. So, one fellow, a scholar in Hindu Scriptures and a fellow who inherited the knowledge of Islam from his educated and broad minded father are growing at two different places. How their path meet each other (or cross each other) is explored in the book quite interestingly. And yes, in the due course we meet with many characters like Zeba, Javed, Nitai and Tara amongst others. The history teaches us a lot and is an account of something actually happened in the past. Eventually, we become biased and remember or explore the only perspective of the incidents which suits our beliefs and assumptions. But, turning the eye away from a side of the coin, doesn’t actually make it disappear, it remains there, but out of our vision. Author Rajat Mitra has acquired his Ph. D. in Human psychology and his work in the area of “Human rights violation” is remarkable. He has a vast field experience, though, it is his debut book. To understand how I feel as a son you have to be a father to me first. Before the prayers begin, she would sometimes sit in front of the Shivling and would find herself transported to another world where she would feel an unmistakable language of silence flow from the stone towards her, cleaning hear heart, telling her that she was no longer alone. Remember, on the path to truth, we all need to walk alone. Remember, it is the opening up of your heart to Allah that matters, not the numbers. Hatred is never born in a day. It lives for mnay years in the human heart before it develops a face. This azaadi of yours is not for getting freedom or justice. That already exists. A shelter remains a shelter. It never becomes a home. There are some conversation which creates their impact through small yet clear and straightforward dialogs. “Then from today our paths do not meet anymore,” said Anwar. The characters grow up gradually and we see various shades and attributes of the same through the story. The book also tells that the change of heart is possible in case of a genuine human being, no matter how many wrongs are done to him. While I cannot reveal the incidents and details, but you see prominent members of both Hindu and Muslim community are loved and saved by the member of the other one. It is a tough act to talk about the brutalities actually happened and at the same time show the blossom or showing a rainbow why painting a dark picture. Rajat does it brilliantly. Actually, the world outside of Kashmir doesn’t have much idea about the actual circumstances there and the actual things happened there. They need to acquire more information about the situations in the valley to actually understand the context of such books. The author is good at developing scenarios and explain the backdrops. In fact, his talent of writing about beautiful surrounding and broken places with equal authenticity is something amazing. The book explores the dark and light both the sides of a human heart. An another important aspect of the book is the best use of footnotes. Yes, you may find footnotes in almost half of the pages. It gives the author the freedom to use the actual words and at the same times makes it easy to understand its meaning to the reader. One complaint I have about this book is the font size. To accommodate the content of the book in less pages comparatively smaller fonts are used. Definitely a worth reading book for open minded readers who can explore tough things without prejudice. It is not a light read but a recommended one. Around 7.5 to 8 out of 10.